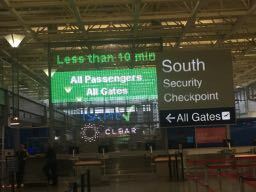 At the Minneapolis airport, I had just checked my bag and was looking for the departure gates, wondering which way to go since I remembered from a previous trip there was a choice of security lines. Turning to my left, my question was answered without having to dig out my phone to look at an app: Instead there was a huge neon green sign that said “Less than 10 minutes… all passengers, all gates.” I smiled and kept walking toward the sign and then took a picture, to remember the power of a highly visible and intuitive message board — something stadiums and other large venues could use a lot more of. Though we make it a point here at MSR to report as much as we can on app-based developments for stadiums, increasingly these days when at a game I find that many times it is simply not convenient to pull up information on my phone, especially so with wayfinding. Let’s leave aside wayfinding apps and beacons for a minute and ask — why, in this age when we can deliver personalized information to a phone, isn’t there more being done with large, video-based signage? 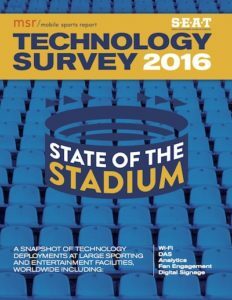 Editor’s note: This column is from our most recent STADIUM TECH REPORT for Winter 2017-18, which is available for FREE DOWNLOAD from our site. This issue has an in-depth look at the wireless networks at U.S. Bank Stadium in Minneapolis, home of the upcoming Super Bowl 52, as well as profiles of network deployments at the brand-new Little Caesars Arena and Orlando City Stadium! DOWNLOAD YOUR FREE COPY today! 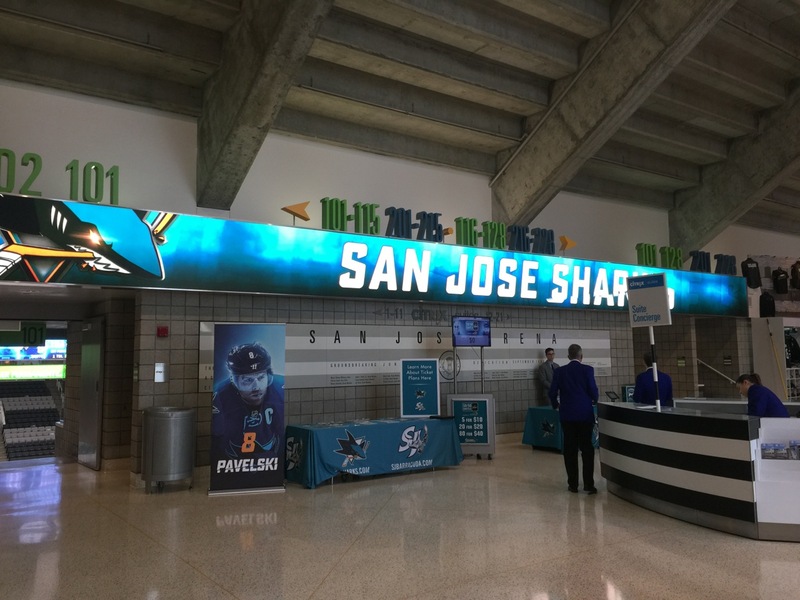 For sponsors and advertising, the revolution over the past few years of LED boards replacing static signage is like moving from telegraph to radio. Stadiums everywhere are pushing each other to see who can add more in the way of ribbon boards, big LED screens on concourses, on walls and of course, to see who can come up with the latest in big main video boards. But even as it’s great that video screens are proliferating inside venues — you may never miss a live play anywhere inside a stadium again, including inside elevators — I would argue that in many stadiums, the strategy behind mounting signs and putting relevant content on them is still in its infancy, especially when it comes to things like updated wayfinding. And while I doubt any of us really wants a future like the one depicted in Minority Report, where signs detect you and show you personalized marketing as you walk by, wouldn’t it be nice if the screens did more instead of just showing live action and synchronized ads? 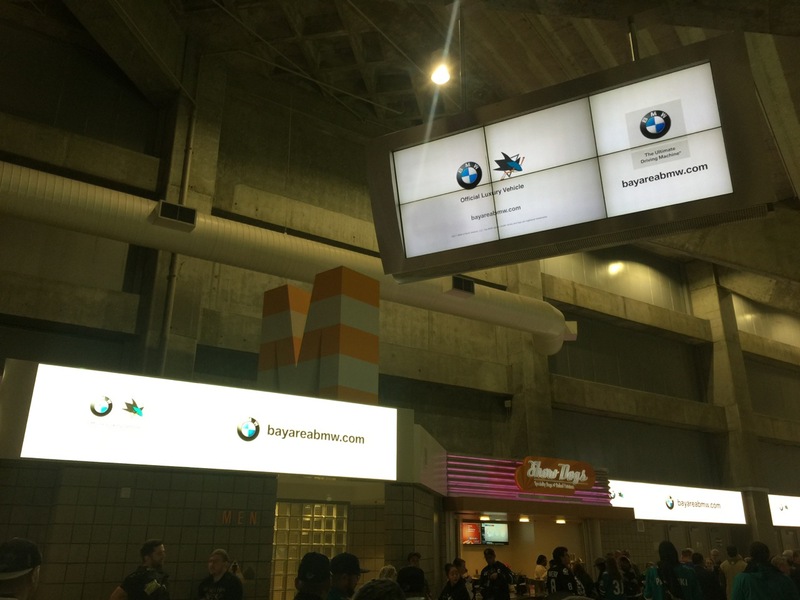 How about some proactive wayfinding, with time-sensitive messages, to help fans find what they need inside the stadium walls? With quick, easy to digest information that doesn’t require three clicks to find? 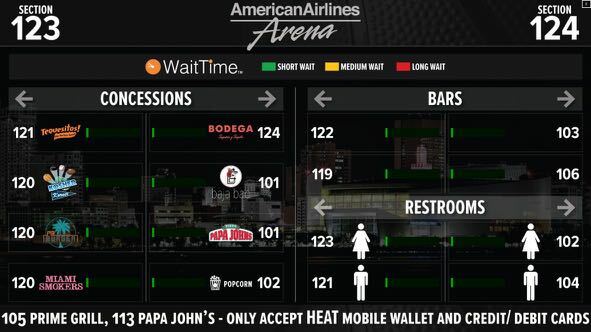 If there’s one loudly touted stadium app feature I’ve never fully bought into, it’s the whole “you can see how long the bathroom line is” app. Though it seems simple and good (and many reporters write about it without questioning it), I see a bunch of holes poking through that are never described in the press releases. First and most telling is that even with multiple versions of this service launched, nobody has yet provided us with any stats on usage, even though we’ve asked politely. One reason I don’t think wait time apps are a powerful idea for crowded stadiums is the simple fact that sometimes it’s not safe to be looking at your device. 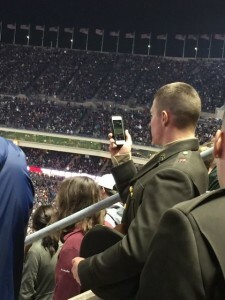 At a recent Vikings game at U.S. Bank Stadium I got a refresher — if you are walking on a concourse during a sellout game, the last thing you want to do is pull out your phone and be a gaper snce you might get gored by some guy with three-foot horns on his head who plows into you when you stop suddenly. Blue-dot directions are great in theory but like texting while driving, in some situations trying to stare at your phone may be hazardous to your health. 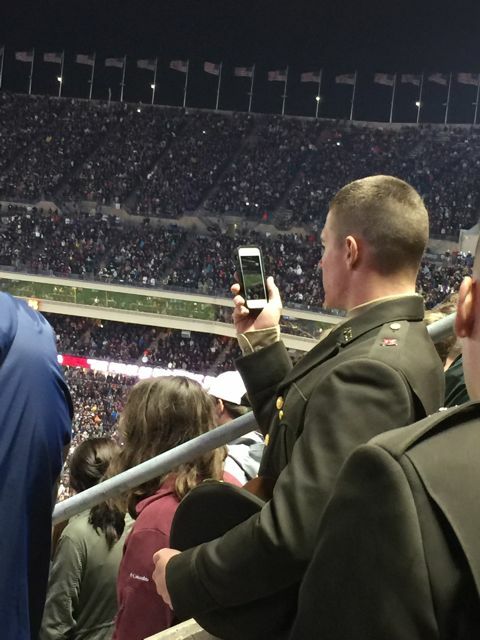 How about using the app while sitting in your seat, before you leave for the restroom? My question to the app provider is — what guarantee do you provide that if I start toward the bathroom with the shortest line, that it will still be short when I get there? And paradoxically, if more fans start using the app the way I am, won’t that make the short lines instantly long if we all head there at the same time? More questions: Do any of these things tell you how long it will take you to walk to and from the bathroom with the shortest line? Or is it smarter to wait instead of walking (especially with a full bladder)? Are wait time apps smart enough to figure all this out? I doubt it. But here is where smarter signs with more limited options come into play. Like the huge neon words in the Minneapolis airport, more interactive displays could go a long way in wayfinding, especially if they are only trying to do a small number of simple things, like, “SHORTER BATHROOM LINE 100 FEET THIS WAY,” or, “HOT DOG AND A BEER FOR $10, AT NEXT TWO STANDS.” I see a big difference in how such signs could differ from an app, by providing just the last piece of information in a process already begun — without any need for click-throughs. 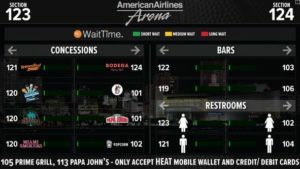 The Miami Heat are starting down this path, with video screens that face the fans when they come up from the stands at American Airlines Arena, with restroom and concession information (with simple arrows) provided by partner WaitTime. While we haven’t yet interviewed the folks at WaitTime to find out exactly how their sensors and algorithms stand up to our previous list of questions, our guess is that many more fans will find the information via the concourse displays than through any team app, simply because A) many team apps still aren’t well known or well used, and B) everyone pretty much knows how to read a sign. This is what I mean when I say we need more tech for signs — the updated information is great stuff, but it doesn’t even have to be that digital. At Golden 1 Center in Sacramento there was an incredibly smart decision made to turn some concession signs on the concourse a simple 90 degrees — so you can read the sign while you are walking, without having to turn your head. It’s one of those things that when you see it for the first time, you wonder why we ever did it the other way. Maybe what is needed are some new form factors, other than the standard horizontal TV screen. The Mall of America (story coming soon!) has some new interactive directories that are more like a big iPad than the old movie-poster models, and they are already reporting millions of user sessions and great feedback from guests. 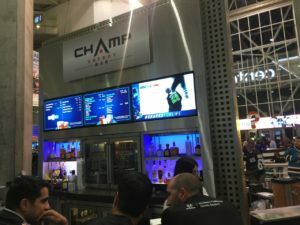 Why not install a bunch of smaller screens in stadiums and other large venues, which could be programmed for specific time-sensitive information? Instead of one large screen with impossible to read small type about baggage-carousel information about your arriving flight, why not a monitor with BIG type that circles through the most recent flights, mounted above wherever you enter the baggage area? How about big arrows in stadiums as a game finishes, directing fans to less-crowded exits? Where are we with this issue now? After Levi’s Stadium opened a few years ago, they had stadium employees with handheld signs after games, trying to direct fans to the light rail. 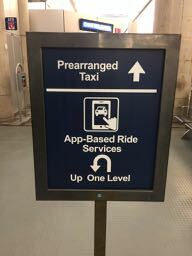 In the Minneapolis airport, trying to find the Uber pickup area requires a treasure hunt of sorts, as you have to find and consult multiple portable printed signs to finally find the curbside spot. And at the Denver airport they use similar portable printed signs to direct passengers to quicker security lines. C’mon man. Time to tech up. Maybe, yes, an app with blue-dot wayfinding could help here but in many real-life big-venue situations — a sellout crowd concourse, or hauling your carryon suitcase to the gate — taking your phone out is sometimes the least attractive option. Instead, let’s see some more tech directed to signs and the strategy behind their placement and content. Let’s call them signs of the times, shall we? 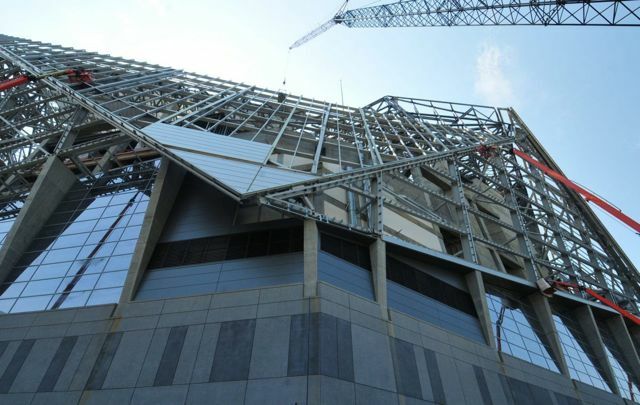 Once just a series of drawings on a blueprint, Atlanta’s new Mercedes-Benz Stadium is getting more real by the day, with walls being added to steel beams, and wires for the internal networks being pulled into place. Though the June 2017 opening day still is many months away, thanks to thoughtful planning many elements of the stadium’s network have already been tested, thanks to a facility created by stadium network officials to test components under situations as close to “live” as they could possibly get. That lab environment helped the network team make its final decisions on vendors and deployment methods, like going under-seat for deployment of most of the 1,000 Wi-Fi APs that will be in the stadium’s bowl area, part of a planned total of 1,800 APs in the entire venue. 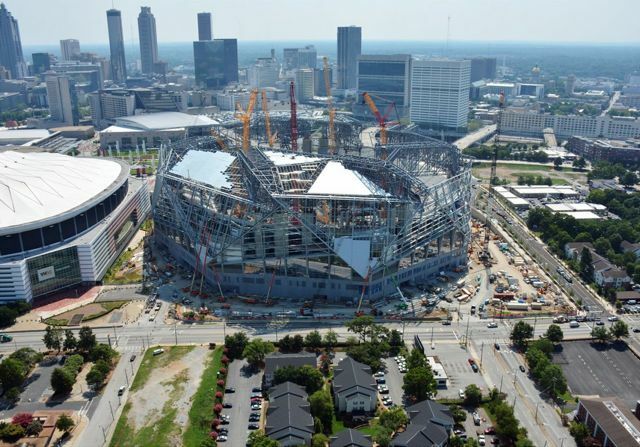 In a recent interview with Jared Miller, chief technology officer at AMB Sports and Entertainment (the entity named for Arthur Blank, the owner of the Atlanta Falcons), Mobile Sports Report got an exclusive update on the construction progress so far for the new $1.5 billion facility, along with new details about the internal network deployment, which will be using more optical fiber than any previous stadium network we know of. Like the network built at Texas A&M’s Kyle Field, the network inside Mercedes-Benz Stadium will have a single optical core for Wi-Fi, cellular and video, using the Corning ONE platform and deployed by lead network integrator IBM along with Corning. Miller also confirmed our earlier report that YinzCam software would be used to host the stadium’s IPTV deployment, but vendor choices for Wi-Fi gear and a stadium app have yet to be named. 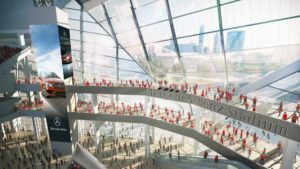 As construction teams continue to hustle toward completion of the building, here are more details from our conversation with Miller about how the Falcons’ tech team went through the process of determining the products and methods that would allow them to construct a network able to “push the limits” on fan connectivity. 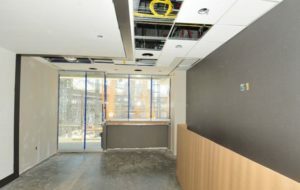 In our early August conversation with Miller, he was happy to report that the planned 4,000 miles of optical fiber were finally starting to be threaded into the new building. “We’re making great progress with a ton of yellow cable,” Miller said. Miller said optical fiber, which can carry more data traffic at faster speeds than copper cable, is a necessary infrastructure underpinning for facilities like Mercedes-Benz Stadium that expect to host the biggest events like the Super Bowl and college football championship games. 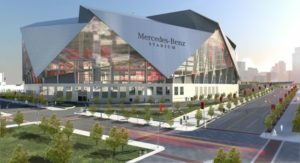 Mercedes-Benz Stadium is already slated to host Super Bowl LIII, the 2018 College Football Playoff Championship, and the 2020 Final Four. “I really believe [fiber] gives us the foundation to grow and react in the future, to handle technologies we don’t even know about yet,” Miller said. On the Wi-Fi side of things, Miller said that Mercedes-Benz Stadium will also mimic Kyle Field’s extensive use of under-seat APs in the bowl seating areas. Miller said the stadium will have 1,000 APs serving the seating areas and another 800 for the rest of the venue, for a total Wi-Fi AP count of 1,800. Since the Mercedes-Benz Stadium network will be using more optical equipment closer to the edge, Miller said that his team used 3D printing experiments to craft custom enclosures for the under-seat APs, both to ensure they didn’t act as debris “traps” and also to add elements like an internal heat sink to diffuse the warmth from the extra electrical components. The heat sink solution involved attaching the AP elements to metal chair railings to dissipate heat, Miller said. After announcing its partnership with IBM in early 2015 as lead technology integrator, the stadium network team spent 6 months reworking the network design, Miller said, a process that confirmed the choice of optical networking at the core. Then to help the network team select gear and components, the Mercedes-Benz Stadium organization built a “full-scale lab facility” that Miller said allowed his team to build multiple live networks to test gear for performance and interaction with other network elements. “The lab enabled us to see firsthand how gear behaved, not just alone but together [with other products],” said Miller, who added that at one time the network team had three simultaneous running stadium networks inside the lab. “We were able to bring in different endpoint devices, like POS systems, and know how it’s going to behave [in a network],” Miller said. 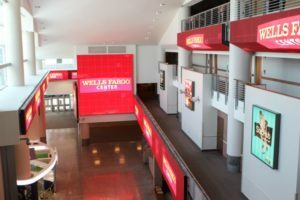 Plus, the network gave eventual business users of the planned gear time to get hands-on experience and training well before the stadium opens its doors. 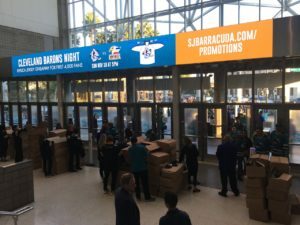 On the DAS side of the network buildout, Miller said the stadium has an on-site, raised-floor room for DAS gear with “ample room” for future growth. “One of those things we learned was that DAS [needs] always double,” Miller said. 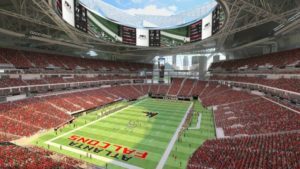 Though the stadium hasn’t yet announced a provider for a game-day stadium application, Miller did confirm that Mercedes-Benz Stadium will use YinzCam software to control its IPTV system, which will cover the 2,500 or so TV screens inside the building. “YinzCam is just the most intuitive and capable content management system,” Miller said. Video is going to be a big part of the stadium from all angles, beginning with the one-of-a-kind “halo board,” a circular screen that will sit inside the retractable roof lines. For standard TV placements, Miller said Mercedes-Benz Stadium will use mainly 50-inch screens and will work with YinzCam to ensure the screens can be seen. In the stadium’s suites, TV screens will be controlled by a tablet application; Miller said that Mercedes-Benz Stadium is also “contemplating adding the ability to control TV screens with a mobile app,” like the system YinzCam deployed at Texas A&M. Though Miller’s concerns are mostly technological in nature, he said there are still a lot of improvements coming to the stadium “that are not always reliant on brute technology,” like the new lower-priced food menus the Falcons announced earlier this year that seem to harken another era with $2 Cokes and $2 hot dogs. 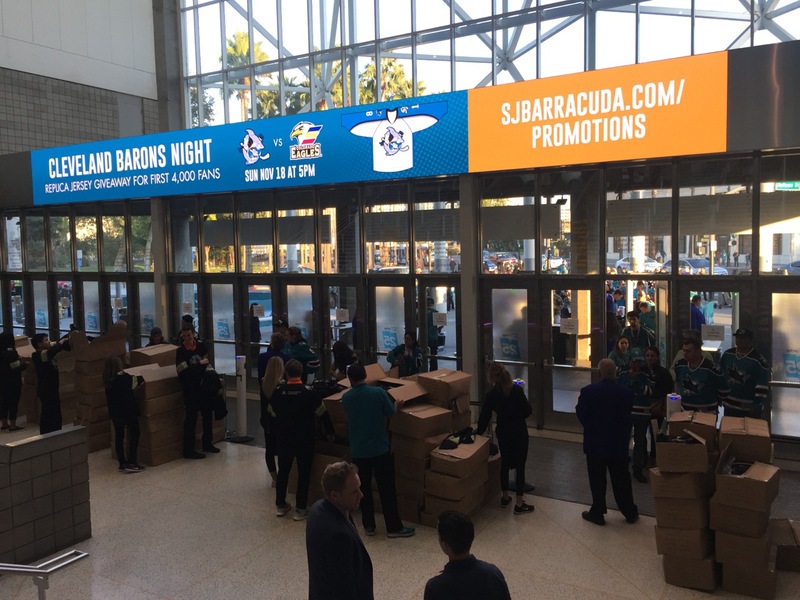 Miller said the stadium team continues to get feedback from a fans’ council, which has tagged the arrival and departure experience as one of the main pain points that needs fixing. 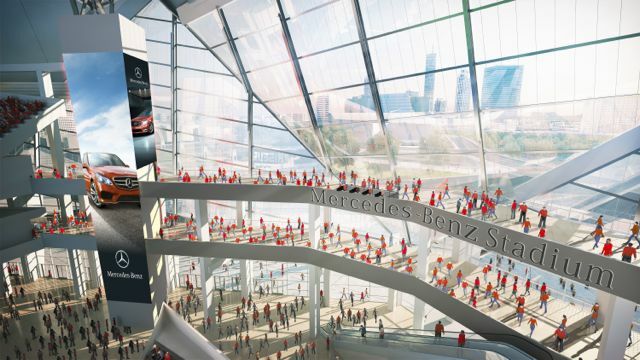 Mercedes-Benz Stadium will try to alleviate ingress and egress issues by doing things like creating “ticketed spaces” perhaps on the big outdoor plazas where many fans can congregate even before entering the stadium doors. By creating such spaces, Miller said fans might be able to enter the stadium more rapidly without the logjams that sometimes occur. 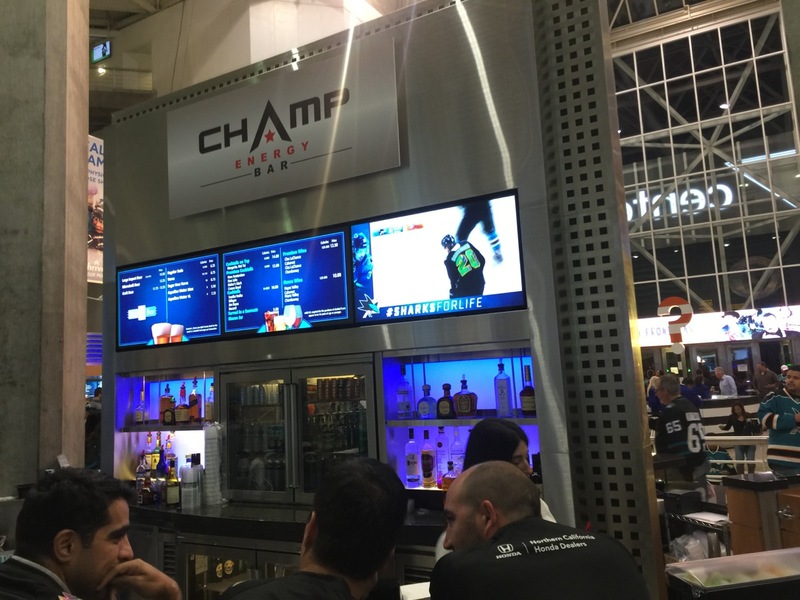 Another amenity that may emerge is the use of wireless charging stations at a number of locations, to combat a scenario that Miller said often happens at marquee events, mainly fans’ phones draining their batteries as they compete with other devices to connect to a wireless network. Wi-Fi analytics and other digital-information tracking programs are still in their infancy, but more teams are deploying digital-communications strategies. 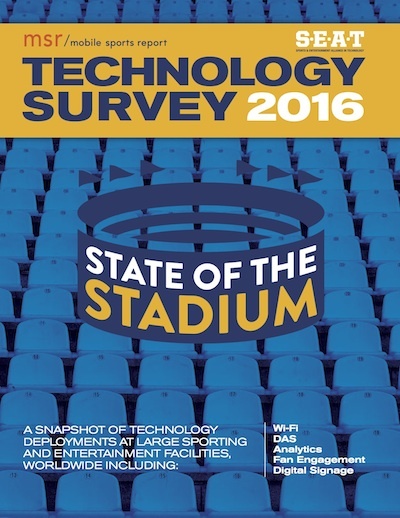 These results are the only statistical breakdown of what’s being deployed in the stadium technology deployment marketplace so… DOWNLOAD YOUR COPY TODAY! Mobile Sports Report would like to thank all the representatives from the major professional sports leagues, including the NBA, the NFL, Major League Baseball, the NHL and the MLS, as well as representatives from major colleges and universities and other sporting and entertainment arenas who took time to participate in our fourth-annual survey. It’s their sharing of time and information that makes our survey possible, so thanks! Mobile Sports Report would also like to thank JMA Wireless for their sponsorship of this year’s survey, which allows us to offer this information free of charge to our readers. The original game plan for the new wireless networks at Texas A&M’s Kyle Field called for copper, not optical fiber, at the network core. 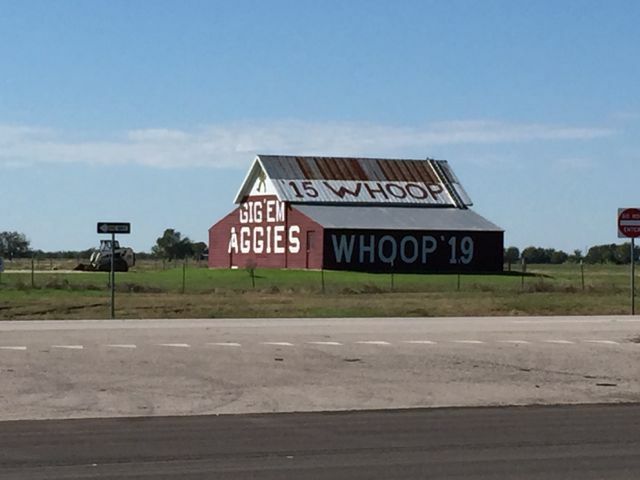 Then came a last-minute audible that changed the game not just for the Aggies but maybe for stadium networks overall. 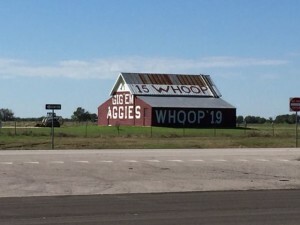 After initially designing the network with a traditional copper wiring system, a late spring 2014 decision by Texas A&M chancellor John Sharp reversed field, switching instead to an all-optical network for DAS, Wi-Fi and IPTV combined. The new network, now in full operational mode, is already being hailed as the future-proof path of the future of stadium network technology, with other schools and pro teams beating a path to College Station to see what they might learn. 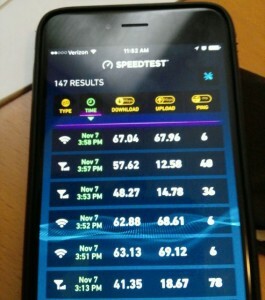 With screaming speeds on both the Wi-Fi and DAS networks and plenty of capacity for now and the future, Sharp’s line-of-scrimmage call to go with an IBM and Corning optical-based network seems to be a huge score, according to a school official who brought the idea to Sharp’s attention. Editor’s note: This story is part of our most recent STADIUM TECH REPORT, the COLLEGE FOOTBALL ISSUE for 2015. The 40+ page report, which includes profiles of stadium deployments at Texas A&M, Kansas State, Ole Miss and Oklahoma, is available for FREE DOWNLOAD from our site. Get your copy today! 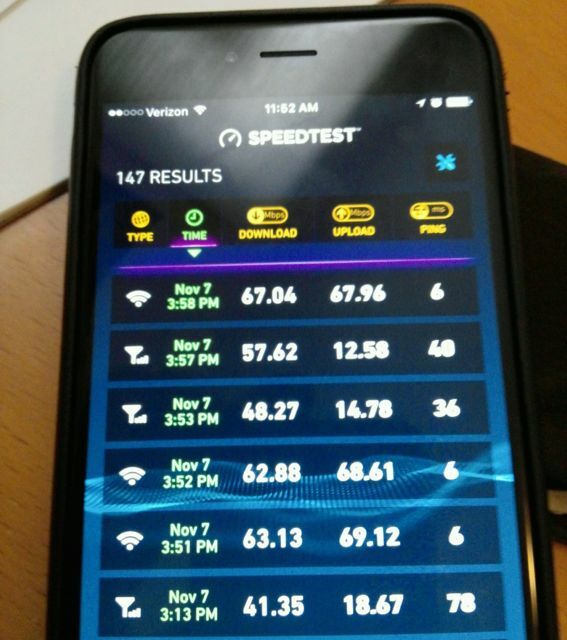 A sample of the Wi-Fi and DAS speed tests we took at Kyle Field. “We had got pretty far down the road with an older, but tried and true [network] architecture,” said Phillip Ray, Vice Chancellor for Business Affairs at The Texas A&M University System. But after hearing and reading about the possible potential of an optical fiber-based network system, Ray brought in Corning and IBM representatives over school spring break in 2014 to discuss the possibility of switching to an optical fiber-based network for Kyle Field – even though the network would have to be ready for the 2014 football season. 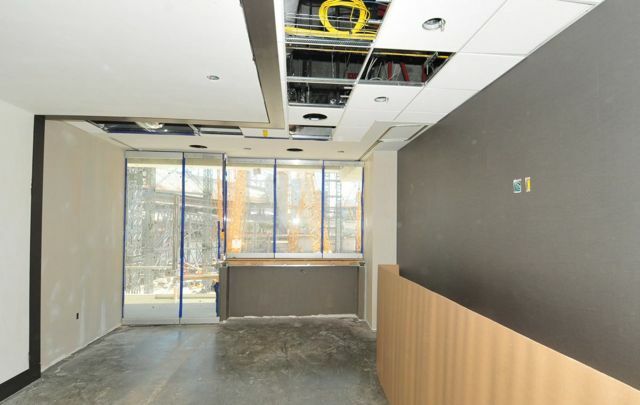 “We had some face to face meetings with chancellor Sharp and discussed all the pros and cons,” said Ray, who had been charged by Sharp with overseeing the network deployment part of the $485 million Kyle Field renovation. Though Ray said he was under a “lot of pressure” to stick with the older-type design, he quickly got a green light from Sharp to take the optical choice and run with it. According to Ray, the total cost of the combined Wi-Fi, DAS and IPTV network ended up being “just north of $20 million,” but that cost was softened when the two largest cellular carriers, AT&T and Verizon Wireless, ponied up $10 million, almost half the cost. “The carriers embraced it, funded it, and want to be with us down the road,” said Ray. “It was a paradigm shift for them, but they wanted to be involved.” While AT&T and Verizon are live on the DAS now, Ray said that Texas A&M already has a commitment from T-Mobile to join the DAS soon, and hopes to also add Sprint before long. Aside from the leap of faith to go optical was the on-the-ground necessity to build the network quickly, since Sharp didn’t want to start the 2014 season without it. Ray said that Todd Chrisner – a former IBM employee who moved to Corning during the past year – “helped lead a Herculean effort” of gear suppliers, service providers and construction workers who finished Phase 1 of the network in time for the first game of last season. Phase 2 of the network also required quick moving, since it didn’t get started until Texas A&M blew up and then rebuilt the entire west side of the stadium between December 2014 and the 2015 season. Again, the network (and the building) were finished on time. Now that it’s finished and working incredibly well, Ray said the Kyle Field network has already been visited by representatives from other colleges, as well as professional football and hockey stadium-networking types. “We get calls every week, and we have people down to share what we learned – we’re an open book,” said Ray. And they’re able to tell a success story mainly because Ray, Sharp and others trusted themselves to switch from an OK play to one that could score a touchdown.